Every month, follow The Savory Spice Shop's journey as owners Mike and Janet Johnston venture through the ins and outs of learning how to franchise their business through our featured series, "From Successful Business to Seasoned Franchise." For more information, visit www.savoryspiceshop.com. 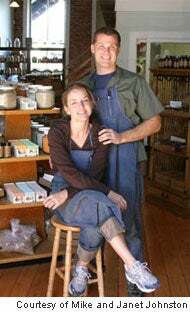 It was the summer of 2004 when Mike and Janet Johnston left their hometown of Chicago and moved west to start a new life--and a new business. Spices. Mike worked in the spice business in Chicago, recognizing that its industry potential wasn't limited simply to the classic foodie demographic. Spices offer something to everyone--whether you're the stay-at-home mom, the guy who loves to grill, the teenager who dreams of becoming a rock-star chef, the sweet tooth, the hothead (aka the chili lover), even someone who doesn't like to cook, you can find simple and fast ways to make a good meal. Knowing this, and knowing he had a passion for the business, Mike started experimenting in the kitchen, inventing new recipes and spice blends, eventually deciding he wanted to branch out on his own. The couple chose Denver, a city with lots of sunshine and a budding gourmet community. The Savory Spice Shop opened its doors in September 2004 on a quaint and up-and-coming street, offering customers 140 hand-blended and freshly ground seasonings. Like many of their loyal customers, I went to Savory craving something more than just good spices. The experience in the shop is as soul-satisfying as the flavor it brings to your plate--and your palate. Perhaps it was the culture, which reminded me of my years of travel. It might have been the sense of community I longed for after a childhood spent among the diverse, ethnic and flavor-bursting community around Chicago; or, let's face it-- I loved walking into a place where everyone knew my name. Admittedly, I wondered: How can they make money from spices? Four years and four stores later, the company continues to break annual profit margins. The Johnstons own two stores on their own, plus 51 percent of a third store co-owned with an employee. The fourth is their company-owned franchise. It has a following from all corners of the city and beyond, with customers who have their own stories and connections to the shop. And that is the Savory secret: It's as much about the experience as it is about the product. When Chris Clark, a retired businessman whose wife was a long-time customer of the shop, cold-called Mike about franchising the business, Janet's initial reaction was doubt. Savory Spice Shop wasn't the "franchise type," she thought. With questions like "What will our customers think?" "Will we lose our local, independent finesse?" and "Will our product suffer?" running through their heads, Mike and Janet carefully weighed their options, realizing that there were more positive aspects of starting to franchise than there were negative. With the chance to compete with big-name brands, opportunity for financial growth and a business formula that worked, they realized they had a window of opportunity. "With a great product, a systemized process and the right economics, we realized we had a repeatable package," Janet says. The couple made a pact: to franchise in a way that makes them both proud. They did their due diligence on Clark, looking into his background and financials, and worked through a series of negotiations. Six months later, in July 2008, they signed a contract, with Clark spearheading their new franchise business. Mike and Janet started planning, accepting that their workload would double, and they opened their first company-owned franchise in Lowry, Colo., in September 2008. They began looking forward to giving others the opportunity to own a community business, a process Mike calls "reproducing small business." Walking into Savory Spice Shop is a reminder of the past. The wood floors are worn from visitors who've come and gone, large jars of spices line antique shelves labeled Cloves, Lavender Vanilla Bean Sugar and Sweet Mama's BBQ Chicken Rub. You can taste test anything you desire, and you always leave having learned something new. This ambience is exactly what Mike and Janet want repeated at their franchises. "The nature of what we do requires the charm and expertise of an owner-operator," Mike says. "We want owners who have more than just the startup dollars. They need the passion." To ensure that new franchisees fit the bill, both Mike and Janet will fly anywhere and spend as much time as it takes to find the right people. Once this cherry-picked team of franchisees develops, Mike says it's his job to ensure that they have the expertise and knowledge necessary to open their Savory Spice Shop doors for business. Behind the scenes, Savory will continue to grind spices in small batches to keep the product consistent and fresh. Mike and Janet's goal: Stay one step ahead, so their franchisees can sell the best product possible. Stay tuned as I follow Savory Spice Shop through its new franchise process. Carrie Bach, owner of Red Raspberry Ink, is a freelance journalist and editor who writes about the things she loves: food, travel and business. Her work has appeared in magazines such as Entrepreneur,and Colorado Homes & Lifestyles. She's navigated her way through more than 40 countries, owns a general contracting business and considers herself privileged to stay at home and raise her two young children, Lia and James. You can reach her at carrie@redraspberryink.com.